The role of a father cannot be downplayed in a child’s life. 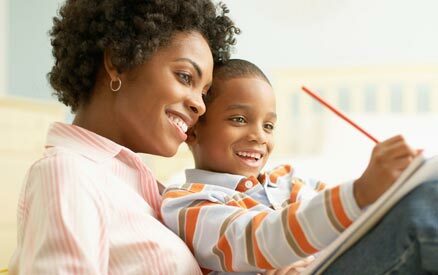 Through social media postings, one can easily deduce the values a man holds dear and the intent of his heart when it comes to good parenting. An American dad is receiving accolades on social media after he shared the special moment he had at his daughter’s school yesterday. 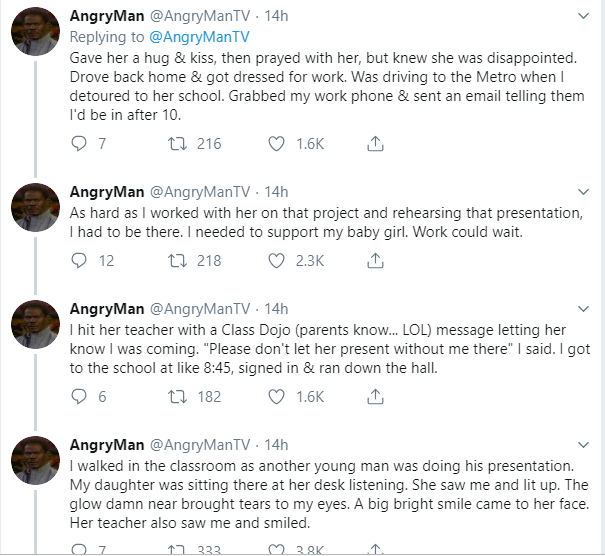 In a Twitter thread, AngryMan@AngryManTV, said he had to suspend his paying job for some hours in order to support his eldest daughter who had a presentation at school. He was able to meet up with his girl’s presentation and as soon as she saw him, she lit up and brought him close to tears. 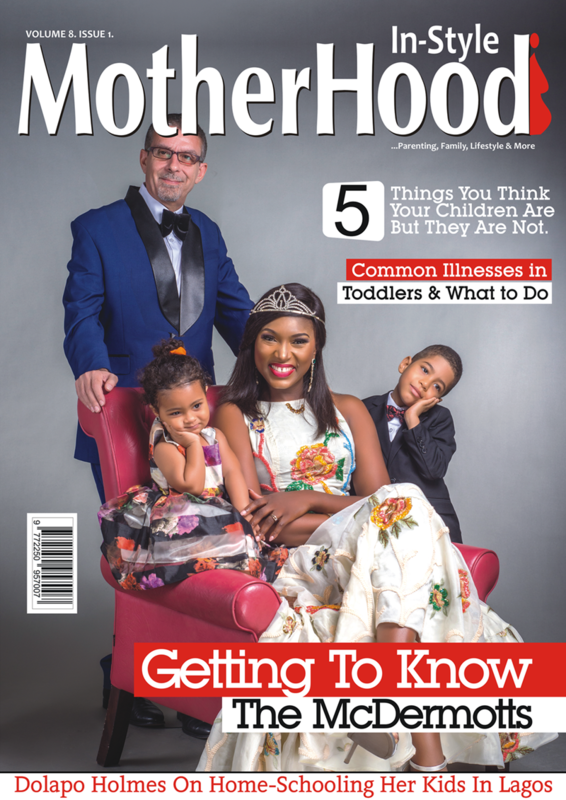 Speaking on his father duties, the dad-of-three said people have different perspectives on parenting which is shaped by their own personal experiences and how they were raised. Sharing his personal experience, the amazing dad revealed that he has lost a lot of friends & family over the past 4 months and the losses has made him numb. This experience, according to him has made him value and appreciate each moment that he has with his kids as no one knows tomorrow. ”Had a really proud dad moment today. Dropped my oldest off at school at 7:30. Helped her carry her project board to the classroom. She was like “You coming back at 8:30 for my presentation?” Told her I couldn’t because I had a 9am meeting in the office. Gave her a hug & kiss, then prayed with her, but knew she was disappointed. Drove back home & got dressed for work. Was driving to the Metro when I detoured to her school. Grabbed my work phone & sent an email telling them I’d be in after 10. As hard as I worked with her on that project and rehearsing that presentation, I had to be there. I needed to support my baby girl. Work could wait. I hit her teacher with a Class Dojo (parents know… LOL) message letting her know I was coming. “Please don’t let her present without me there” I said. I got to the school at like 8:45, signed in & ran down the hall. I walked in the classroom as another young man was doing his presentation. My daughter was sitting there at her desk listening. She saw me and lit up. The glow damn near brought tears to my eyes. A big bright smile came to her face. Her teacher also saw me and smiled. A few more kids did there presentations and then my daughter was up. Man, listen. She killed it!! Everything we had practiced and then some. She was articulate, spoke clearly and loudly. She answered all questions from other students with ease. When she finished and sat back down, I walked over to her desk, gave her a quick kiss on the forehead & told her “Amazing job!!”. Another one of my partners was there supporting his son. That dude had just got off work after working a 12 hours overnight shift, but was there to see his lil’ man. I stayed and watched his son’s presentation. Afterwards we left and just talked about the sacrifices we make as fathers and how often we’re overlooked. I appreciate the brothas in my circle. Great fathers who care. I left the school and got to work at like 10:45. I ain’t care what nobody had to say. Nothing else mattered. An overwhelming feeling of pride has been with me all day. I look forward to getting home to give her another big hug and listen to her tell her story. There’s a certain pride parents have when kids are successful. It could be as simple as their first steps as a baby, then finally learning how to ride a bike, them graduating HS or college, them getting their dream job or marrying someone they love. We smile & are happy for them. Everybody’s perspective on parenting is shaped by their own personal experiences and how they were raised. How we all go about things might be different, but ultimately I hope each parent is overwhelmed with happiness when their child succeeds. I got three under age 10. Schoolwork, projects, presentations, band, swimming, soccer, gymnastics, basketball, tennis, etc. Time consuming. Yet, I love it. Wouldn’t trade it for anything in the world. I don’t need to be father of the year, only the best father to the ones I’m responsible for raising. I’m doing what I’m supposed to do. Nothing more or less. God blessed me with them and I’ll take care of them and provide for them along with The Mrs.
Had a really proud dad moment today. Dropped my oldest off at school at 7:30. Helped her carry her project board to the classroom. She was like "You coming back at 8:30 for my presentation?" Told her I couldn't cuz I had a 9am meeting in the office. Such moments are irreplaceable! Thanks for sharing this beautiful story AngryMan!